Milestone reached on latest phase of works at prime North East development site. Significant progress being made onsite at Follingsby Max development with £15 million package of earthworks and infrastructure enabling works well advanced. Pre-development works on the new 2.5 million sq. 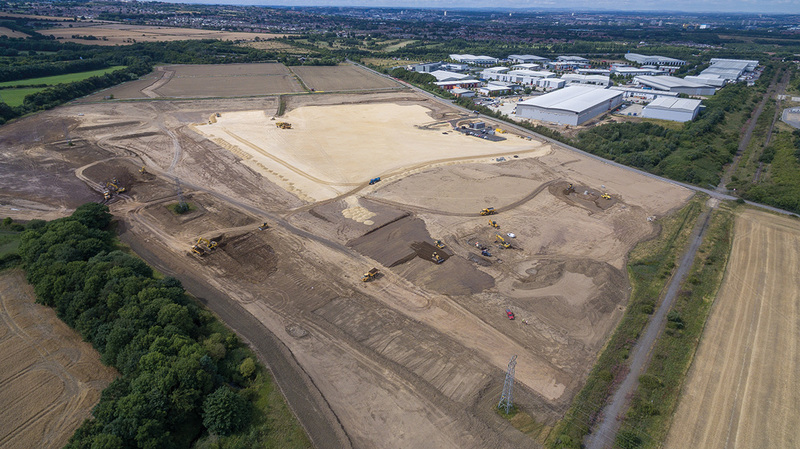 ft Follingsby Max prime distribution/industrial development situated in Gateshead being developed by Highgrove have progressed a stage further with practically half of the 250,000 cubic metre of cut and fill earthworks now having been being completed. At the same time, a series of ‘green Infrastructure’ works have commenced including formation of attenuation ponds and drainage features together with completing the capture and relocation of almost 25 great crested newts. “It’s very pleasing to see the development really now starting to form as the pace of infrastructure works and pre-development accelerates. We are firmly on track to having the development plateaus complete, fully serviced and oven ready for development by the end of the year. The marketing campaign is now in full swing as we seek to highlight the characteristics of the development and specification, prime location and suitability for a range of potential occupiers with high-bay units from 200,000 upto 2,500,000 sq ft.
Follingsby Max sits in a prime strategic location and is ideally placed to support the growth of the region’s key sectors. It will provide high quality, flexible accommodation opportunities suitable for distribution, logistics operations, manufacturers and automotive companies.